I’ve written before about the similarities between children’s books and artists’ books. This is not, of course, an original observation. Others, including Keith Smith in at least one of his books, have noted the similarities as well. 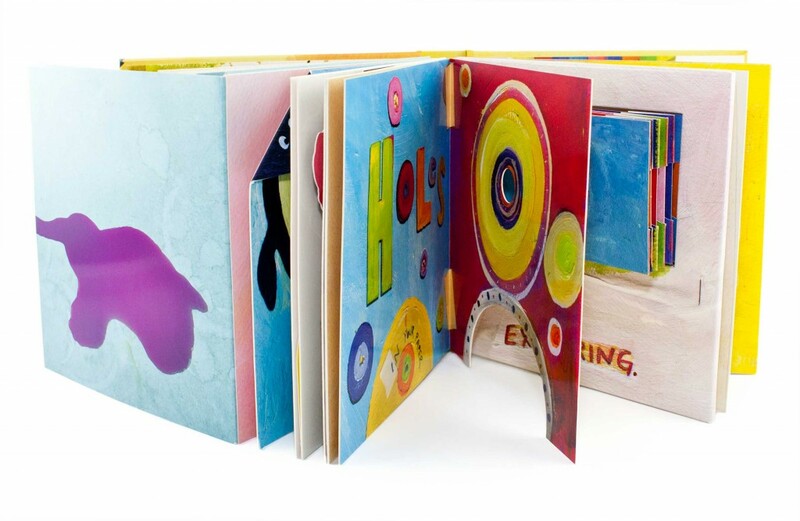 I’ve come to the conclusion that if you are interested in artists’ books and book arts, you should make a beeline for the kids’ section in bookstores and the book section in toy stores any time you manage to go to either such establishment. Some of the best ideas for book formats are often found in those places. Ignore the subject matter in many–I suspect most of us don’t get excited over “Baby’s First Counting Book” and the like–but you might very well be inspired by the format of that same book if it has unusually constructed windows that open to reveal things embedded in the thick pages underneath, or pages designed to look like tabbed directory pages. In this book, one part of each page spread is glued on top of another, leaving a space carved out for the adjoining foldout to fit inside. When the foldouts are flattened back into the book, everything is neatly positioned and flat. I especially love board books. (I suppose if I were being a properly grown-up Serious Book Artist, I’d say I like stiff-leaf structures). There is just something about a book with such heft and texture. 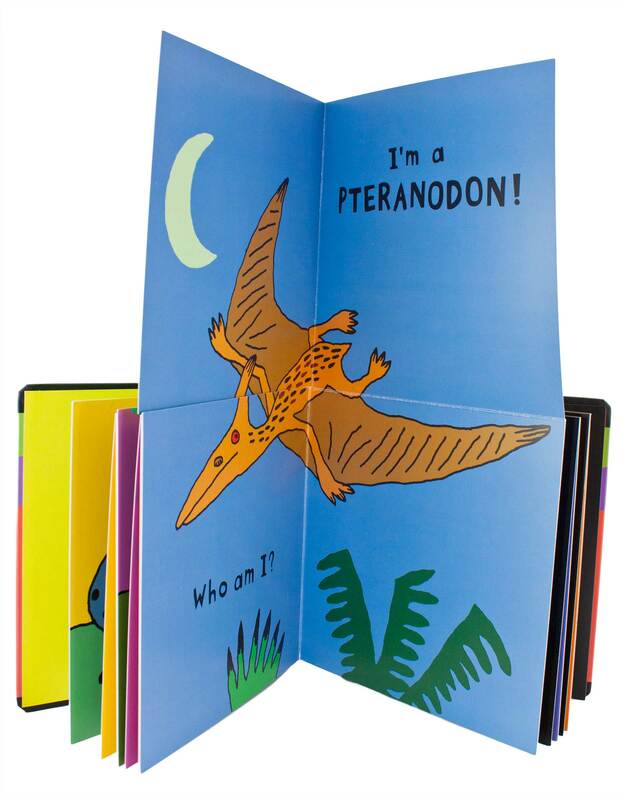 Those thick pages are so satisfying to turn and run one’s hands against (board books often use nice, substantial papers that have lovely tactile qualities). Durability is often cited as a reason why board books are so popular for children. But they are just plain fun to hold as well. The majority of commercial board books have a drop spine that folds away from the book as it is read. 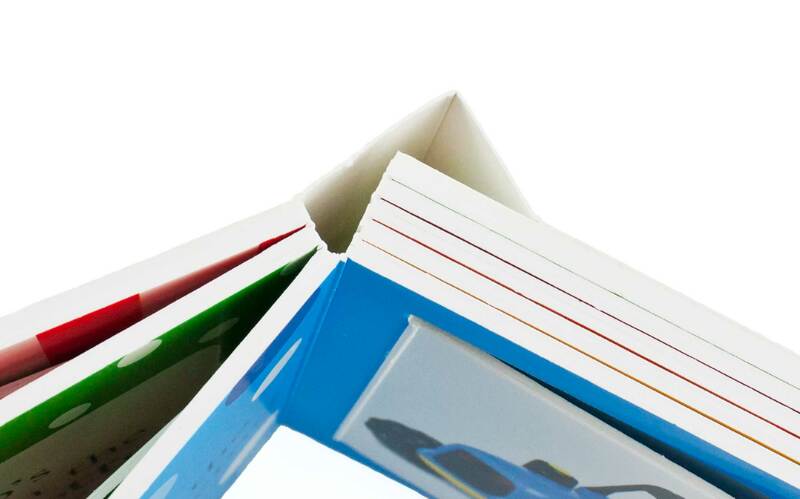 This allows the book to have a tight fitting cover when closed, yet when opened the page spreads can lie perfectly flat. Aside from a drop spine’s practical role, I just think it’s so pleasing to have a spine that varies in shape as the book is read. Cool, isn’t it? Admit it! And if you still don’t know what I’m talking about, find a commercial board book with a tight-fitting wrap-around cover (the common style cover that most have). Open it up and notice the shape the spine makes as it folds away from the book as it is read. Simple, but satisfying. 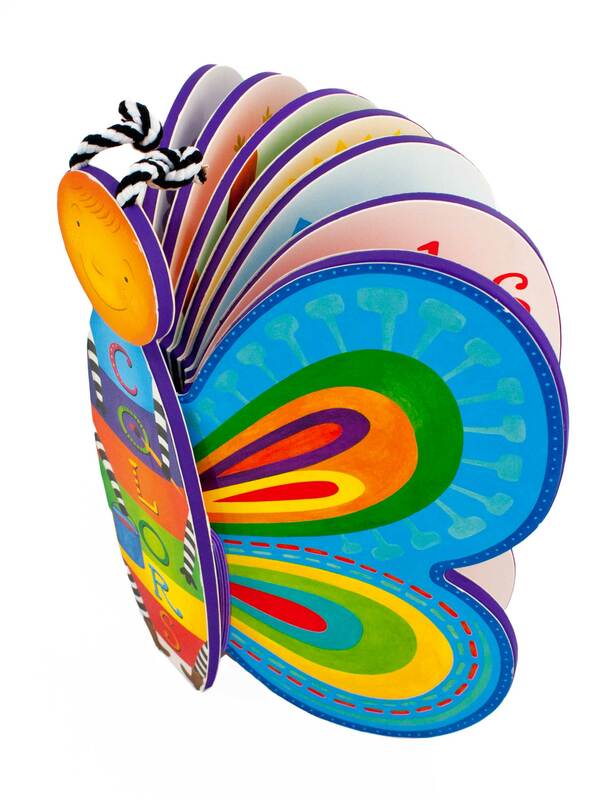 A while back, I started putting together a board book model collection. I suspect the folks at the local book shops have come to realize that I’m not actually a doting auntie buying gifts for a young someone else. I love to look through my collection. Shaped pages. 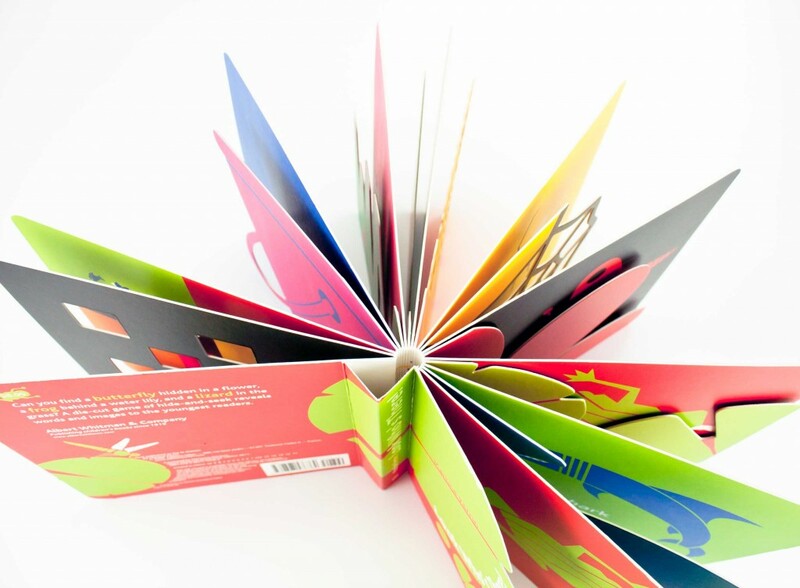 Because the pages are so thick, board books are a good choice for sculptural books. A drop spine hidden underneath a decorative spine element. Nice weight and presence in the hands. 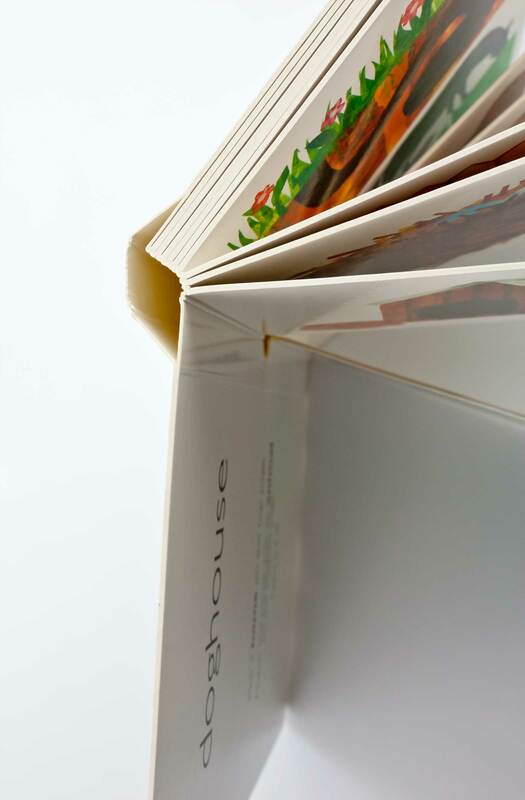 Flat pages with no sewing–great for page spreads that need to be presented flat and uninterrupted. And no page imposition, since the page spreads are glued back-to-back, not nested. The thickness of the pages allows all kinds of opportunities for cutting through layers and embedding details, cutting into pages to make windows or peep holes or to layer scenes, or making shaped pages that stand up firmly. Thick, solid pages also offer an ideal support for page pullouts, pop-ups and the like. There’s that fun drop spine thing. Pages of all different sizes. 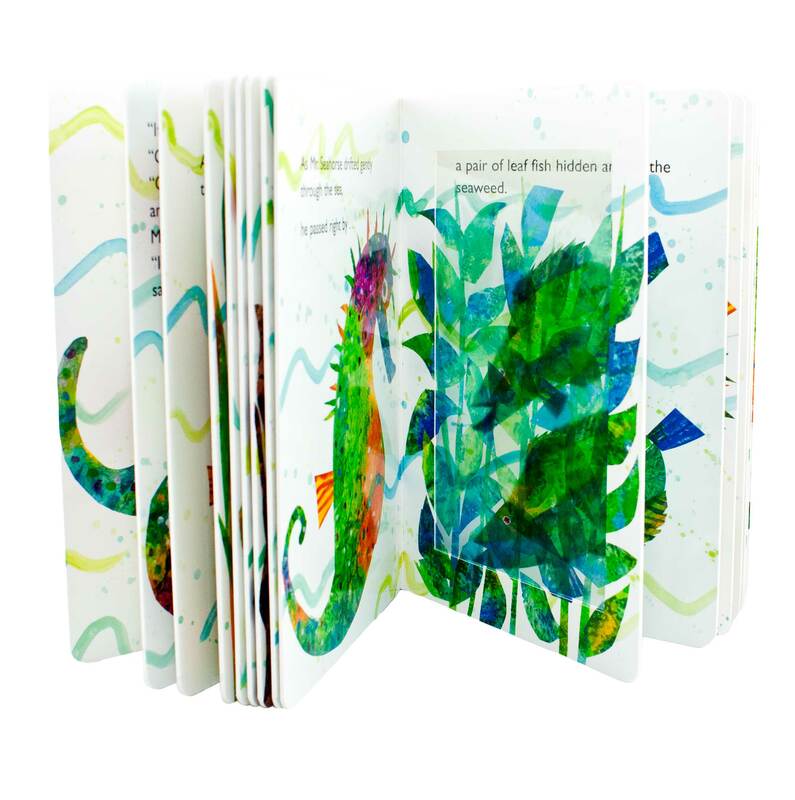 Double-thick tabbed pages with flaps that fit inside a raised border. 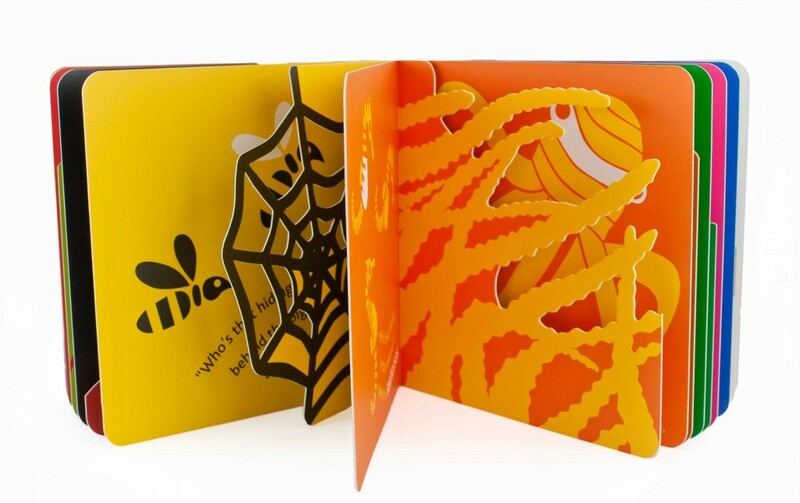 The toddler subject matter does not excite, but the structure itself offers interesting possibilities to try out in a book design. Top view of the drop spine construction on the book with extra thick pages. 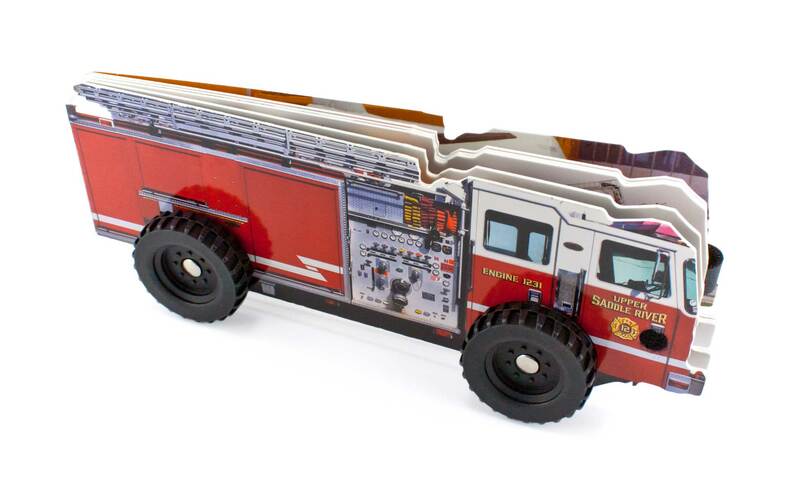 A book that rolls on wheels. Pages with transparent, printed windows. Mylar or something similar can be sandwiched between the board and the paper covering it, or between two boards mounted together. 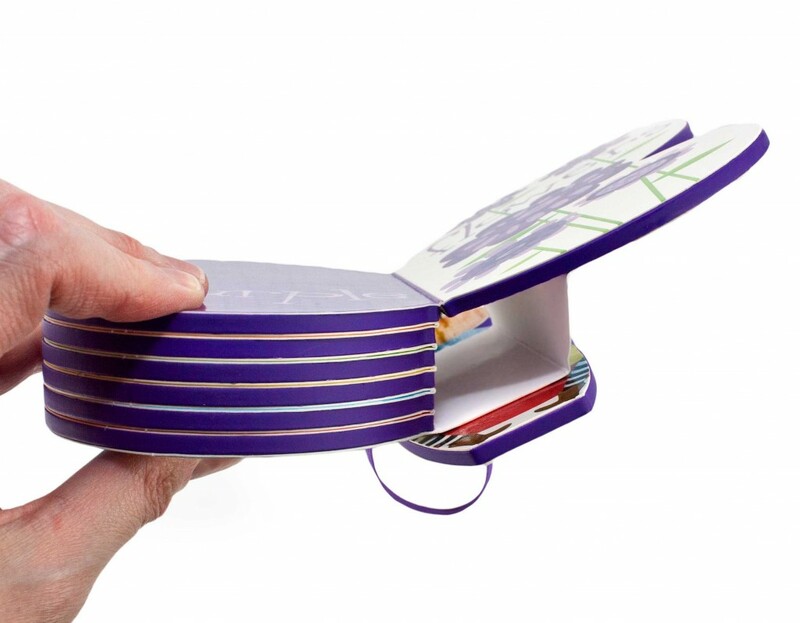 Shaped pages and an embedded tunnel book. 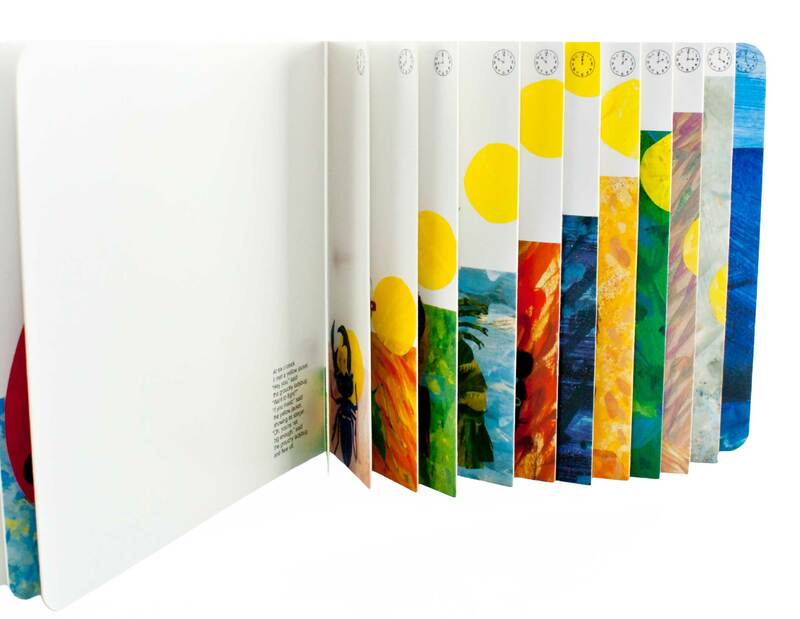 Commercial board books with split pages (a variation on an exquisite corpse), often have a double-sided version of the drop spine. There are extra folds on either side of the spine that allow the page segments to move back and forth independently when the book is open, but allow the spine to fit snugly when the book is closed. Top view of the double-sided spine construction. 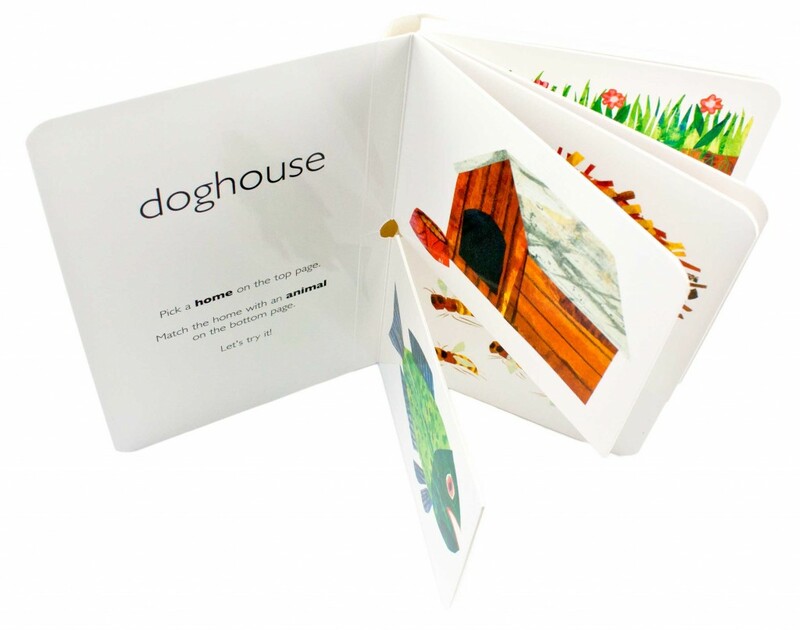 But I think grown-ups should have more board books–especially if they are artists working with books. 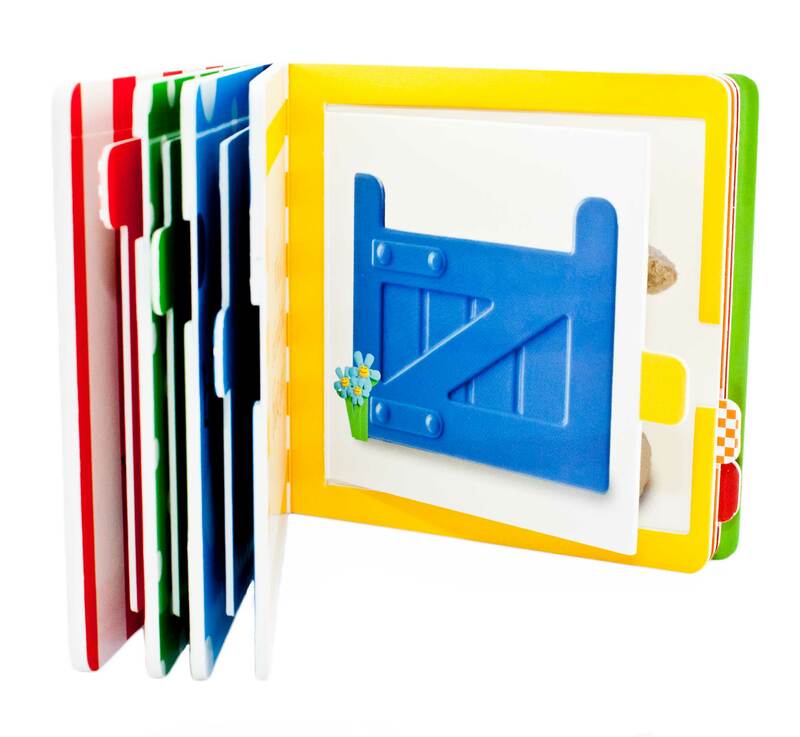 I’ve looked around online and have realized that there are few instructions out there for people who want to make board books from scratch by hand. Since I just taught a workshop on it and it’s fresh in mind, that will be my next post. Animal Spots and Stripes Britta Techentrup. Baby Baa Baa Dawn Sirett et al. Oooh. Serendipity at its best. I posted a children’s book to you on the weekend. And never mind artists, I also drooled my way through this post. I could almost feel those books, and they would have such a satisfying heft to them. I also really like the sense of fun encapsulated in the best childrens’ books. Oh wow! Thank you so much! I will be eagerly awaiting its arrival. Children’s books… they are just so much fun, aren’t they? And I wish you could pet these books as well. The paper on these varies from silky and matte to slick and shiny. They are so multi-sensory. It was a delight during the workshop to see everyone crowding around the board book examples, with big grins and a few happy giggles. Silver sprinkles from the Sky Fairy upon you! I can find very little in any of my books…so I’m winging it! “Winging it”… are you referring to your BAO editions? Ultimately, winging it is the only way, I think. Your collection is the best — especially the ones you’ve made! I love your book for Bored Children Ellen – you wicked girl! I have to confess that I had no idea that the structures were so interesting in kids books. I don’t think that I had really looked far beyond pop-ups, so thanks so much for shedding light on this. How exciting that you’re teaching workshops! I’ll be looking forward to your next post. Thanks! Makes me smile to be called a wicked girl! “Teaching workshops” might be a bit overstated. Our local guild offers a workshop each month, mostly taught by members. I offered to do this month. I’m glad I did–it was surprisingly enjoyable. And seeing as one of my BAO editions is a board book… well… gets me in the groove a bit more. Now I just need to find the energy and time to do it. Yike! You know the feeling, I’m sure. 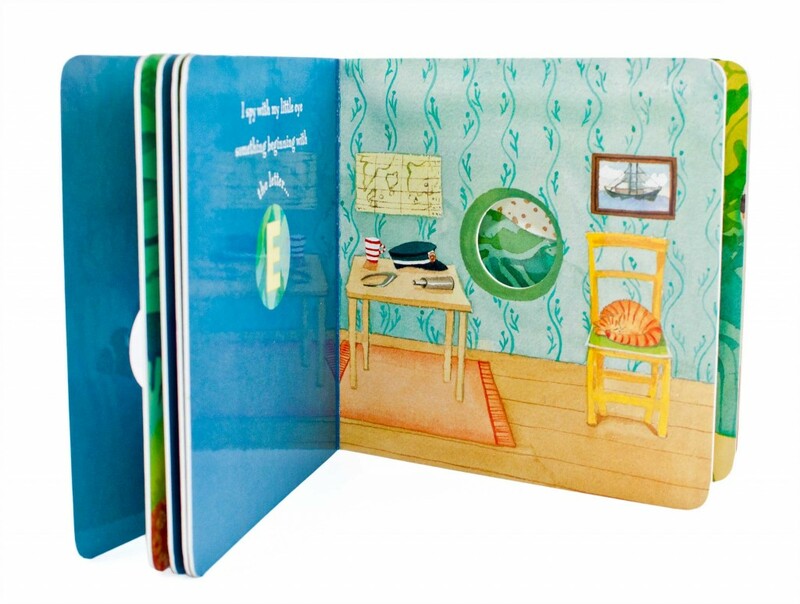 I too love board books – and books that hold secret mysteries. And I am lucky enough to have small grandkids to share them with. They love looking behind flaps and feeling interesting textures and studying constructions. Thank you for sharing these lovely books! Thanks for leaving a comment. I’m glad to know others see the appeal too! Your grandkids are lucky to have such a book-loving grandmother. 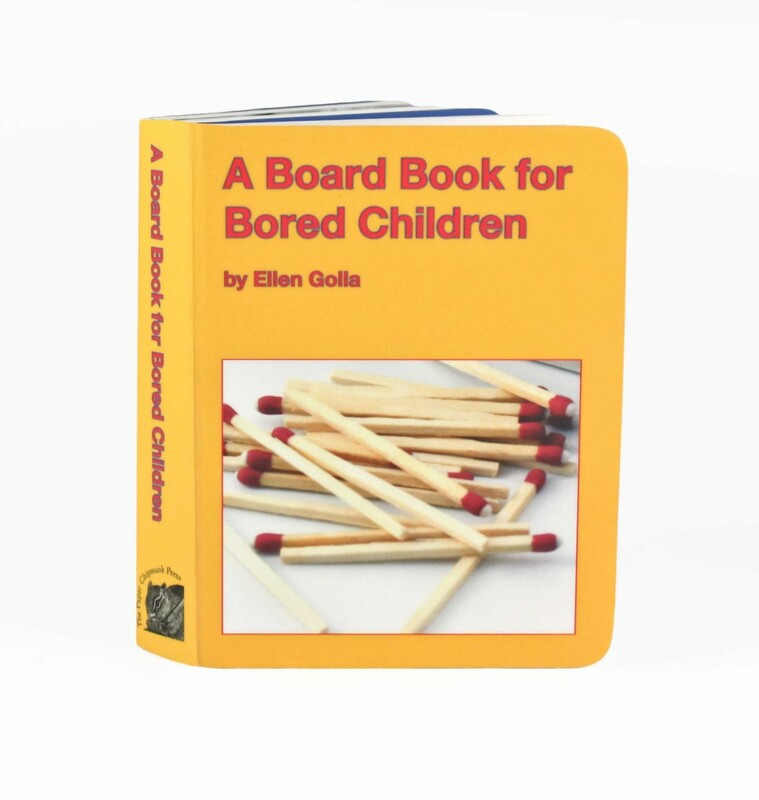 Oh, Ellen, I erupted into evil giggles when I saw the picture of your bored board book. Brilliant! Kristabel! So good to hear from you. I showed that book at Eureka Books last year during my show. It has a page that shows a fork going into an outlet. During the opening, it was kind of amazing how many people felt compelled to share their own childhood electrocution stories. . . among other things. Oh dear. In the past year I have seen a good selection of recent children’s books, and I must say, your collection is really beautiful. Only through my children I now appreciate them, they indeed have interesting structures. One of little boy’s books that I really like (and the type is, if I may say so, missing from your collection) makes completely mechanically generated noises by pulling tabs like you would expect from a movable book. For example there is the picture of the street sweeping car, and when you pull and push the tab, the wire broom elements move and make a scratching noise that indeed comes very close to the sound this makes. There are also a helicopter and a tractor which are pretty good. The “sound machine” is all secretly stored within really thick boards. Just a shame that the text along the images is really awful. Really, AWFUL! And I do share your admiration of the drop spine which I discovered on these books when I bought them for my kids; never really noted them before. When visiting my parents I discovered some of the board books I had when I was a kid. It seems they were made completely different back then. Not one drop spine. All accordions connected by book cloth. But they all still are o.k. (and I have three younger sisters) while the new books I bought for my kids already now show severe sign of use. Made me think. Interesting. I think I might’ve seen some noise maker books before, but I’m so noise averse I’ve been avoiding them! Makes me wonder, though, now that you point it out. I don’t think I’ve come across ones that have mechanical noise devices. I will have to investigate this further. Sadly, yes, the actual content of some of these kids’ books can be…um…less than desirable. On the other hand, I’ve come across a few with really beautiful illustrations or strangely pleasing tactile appeal. It varies. But it is disappointing when it’s so obvious that the actual content of the book was an afterthought. How interesting, too, about the drop spine. I must say, until fairly recently I’d never noticed it. I wonder how long it’s been a feature on these kinds of books. 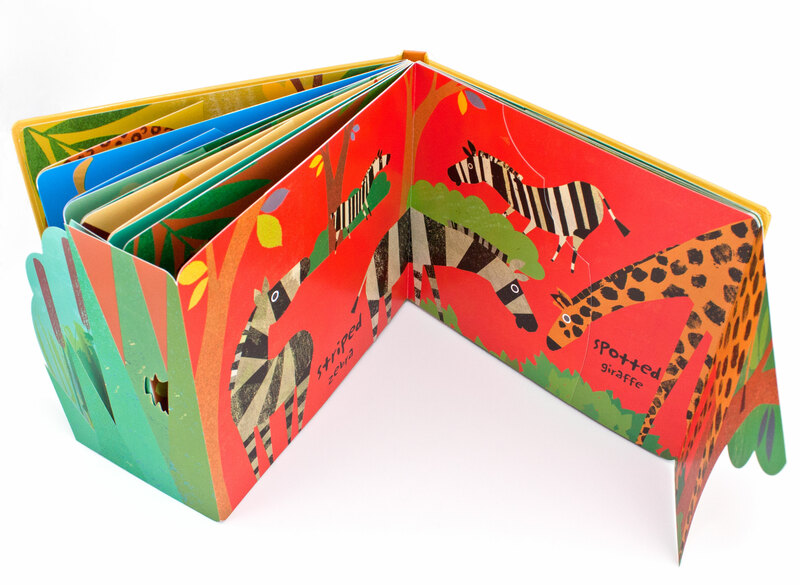 I have one of those older board books with the book cloth, and I adore it. And, indeed, it seems so much more sturdy than anything available today! I think I know what you mean about the noise aversion. We put out the general rule that we don’t want any toys for the kids that operate with batteries. Surprisingly, I found out, this is something that also has to be remembered when buying books. The only book with batteries we have I actually bought myself. The kids love it, though. But this one works just mechanically, and I like how it does. Here is another similar book by the same author that has a video that shows the noises. The video itself is about as good at the text. Argh! But the noises are accurate – this is exactly the sound the book makes. Neat, isn’t it? I am actually pondering to buy this second one, too. Quite belated here, but I wanted to let you know that I did watch the video and researched these books a bit online. They do look intriguing! Thanks. Thanks Nurse Myra. Lovely to see you here again.